Citation: Meldolesi J. Ectosomes and Exosomes-Two Extracellular Vesicles That Differ Only in Some Details. Biochem Mol Biol J. 2016, 2:1. 1. The biogenesis of the two vesicles. Ectosomes are generated directly from the plasma membrane, the exosomes, accumulated within the multivesicular bodies, are released upon exocytosis of the latter organelles. 2. The dissolution/navigation of the two types of extracellular vesicles. 3. Their fusion with specific target cells. 4. Their accumulation in the serum and urine. The conclusion emphasizes the relevance of ectosomes and exosomes in physiological and also pathological processes. The physiological processes include the expansion of the functional cell space; the concentration of specific components in the ectosome/exosome membranes, distinct from the plasma and multivesicular body membranes; the concentration of content molecules (proteins, RNAs and also DNA sequences) with respect to the cytosol; the external fusions with target cells. Among the pathological processes are the diagnoses of cancers and of other diseases. Discussions about the two types of extracellular vesicles, ectosomes and exosomes, are now very popular in cell biology. The definition of these vesicles is however still debated. Their distinct origin, i.e., the generation of ectosomes by shedding of the cell surface membrane, of exosomes by exocytosis of multivesicular bodies (MVBs), proposed first in 1999 , is now generally accepted. However, other properties of the two types of vesicles, such as their size, protein specificity, mechanisms of generation and many others, are still debated. Disagreements depend not only on the conflicting findings of various laboratories, but also on the nomenclature used for the two types of vesicles, that has changed repeatedly during the years. The name exosomes, that from 2000 indicates the vesicles trapped within, and released from MVBs , had been employed from 1987 to define vesicles released from the surface of reticulocytes during their maturation . The vesicles released from the cell surface, referred to as ectosomes from 1997 , had been, and still are, indicated with other names: nanoparticles, microparticles and microvesicles; shedding vesicles and shedding bodies; exovesicles and even secretory vesicles and oncosomes. In a recent review, Emanuele Cocucci and myself made an effort to “shed the confusion between extracellular vesicles” . In addition to the nomenclature, anticipated in this introduction, the effort was focused on a number of other properties previously reported as differences between one and the other type of vesicles. In this comment I will summarize our opinions about these properties. A detailed discussion of these opinions can be found in the previous review . The profound difference in the biogenesis of exosomes and ectosomes have been carefully re-considered in several publications. The vesicles of the first type, accumulate within the MVBs, are released sometime after their generation, upon exocytosis of the latter organelle, possibly, but not necessarily dependent on stimulation of the cell. Ectosomes, in contrast, are assembled in the plasma membrane at a fast rate that increases considerably upon specific cell stimulation (Figure 1). Figure 1 Biogenesis of exosomes (left) and ectosomes (right). 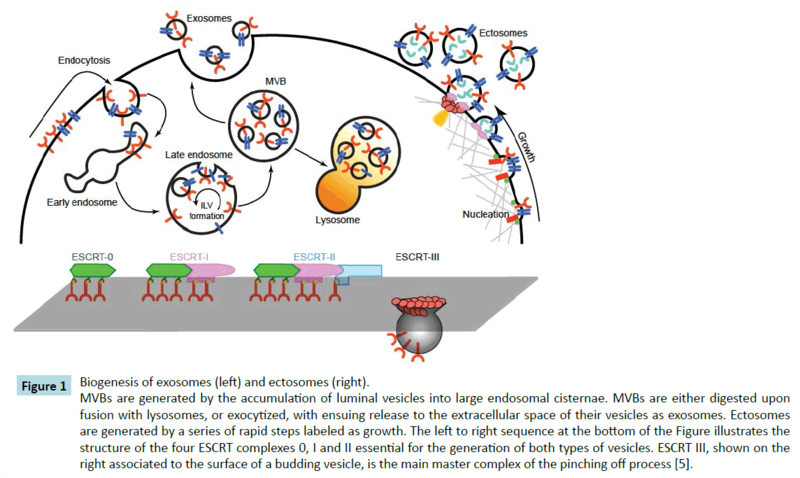 MVBs are generated by the accumulation of luminal vesicles into large endosomal cisternae. MVBs are either digested upon fusion with lysosomes, or exocytized, with ensuing release to the extracellular space of their vesicles as exosomes. Ectosomes are generated by a series of rapid steps labeled as growth. The left to right sequence at the bottom of the Figure illustrates the structure of the four ESCRT complexes 0, I and II essential for the generation of both types of vesicles. ESCRT III, shown on the right associated to the surface of a budding vesicle, is the main master complex of the pinching off process . In their initial state exosomes appear as small, inward buds protruding towards the MVB content; ectosomes as discrete plasma membrane domains marked by layers of dense material associated to their cytosolic surface. Within seconds, or at the most within a few minutes, the ectosome domains undergo outward budding followed by their pinching off as round vesicles. The mechanisms that govern the membrane dynamics, based on the subsequent participation of 4 protein complexes, the ESCRT complexes, were initially reported to be exosome-specific. Recent studies, however, have shown that these mechanism participate in many (possibly all) membrane buddings and fissions, including not only those occurring in the biogenesis of ectosomes but also in other processes such as cytokinesis and virus budding. The released ectosomes and exosomes contain a matrix, composed by proteins, RNAs and also DNA sequences, which are more abundant in ectosomes. The two types of vesicles are both spherical in shape. Their size, however, is significantly different. Diameter of exosomes is small, varying from 50 to 150 nm. Diameter of ectosomes is larger, often reported to vary from 100 to 1000 nm. The doubt is whether vesicles larger than 350-400 nm are true ectosomes. They could in fact result from plasma membrane fragments released during cell apoptosis. In conclusion, differences in size between exosomes and ectosomes really exist. However they may be smaller than often reported. Ectosomes and exosomes are expressed by most, if not all types of cells. Some specificity of the two types of vesicles exits, however in most cases it is not complete. Several proteins were initially defined as unique markers of a single vesicle type, present in all types of cells. However, some of these proteins, abundant in one vesicle, were shown later to be present also in the other type, although at smaller level. In our review we did already question the employment of many such proteins as markers. Only two proteins, CD63 and CD61, were shown to be real markers of exosomes, and two others, TyA and C1a, markers of ectosomes . Upon release from their cell of origin both exosomes and ectosomes undergo important processes. Some of them dissolve in the extracellular fluid. The present evidence emphasizes the relevance of this dissolution for important molecules, such as interleukin 1β, TNF and various growth factor, that are released regularly even if they do not follow the classical pathway of regulated secretion. Many other vesicles undergo navigation, initially in the extracellular medium that surrounds the cell of origin. When navigation is short, the vesicles fuse with nearby cells. Cell fusion is an interesting, still little understood process. Clear evidence has shown the process to be not general, but specific for peculiar cell targets. Exosomes and ectosomes attach first to the external surface of the plasma membrane and then begin rolling over such surface. Rolling stops when vesicles bind to their specific surface receptors which however are still largely unknown. The event that follows binding is fusion, quite different from the intracellular fusion events, similar in contrast to the cell fusions of viruses. Upon fusion, the proteins of the vesicle membrane are incorporated in the plasma membrane of target cells. The proteins, RNAs and DNA sequences that, in the cell of origin, had been loaded within the vesicle, are released to the cytosol of target cells. The consequences of these fusions may be different. If original and released target cells share their expressed genes, the changes induced by vesicle fusions may be marginal; if the expressed genes are different, target cells can change their phenotype and behaviour, for example by assuming different migrations and growth rates, due to the expression of new genes/ RNAs. However, not all navigations of extracellular vesicles are short. Vesicles of various specificities can in fact undergo long navigations. In this case their pathway can include filtrations through capillary walls with accumulation in the serum, urine and other fluids. In fact, mixtures of extracellular vesicles are always present in these fluids. In pathological conditions, particularly during growth of cancers and a few other diseases, the concentration of vesicles in the fluids increases, with changes of their specificity. Therefore, analyses of these vesicles can be important for the diagnosis of diseases and possibly also for the choice of their therapy. The investigation of vesicles isolated from the fluids is therefore of growing interest. In the near future it is expected to be employed more and more, especially when diseases are suspected or recognized at an early stage. The two types of extracellular vesicles, originated and released by completely different processes, share many properties including many molecules and several functions, important from both physiological and pathological points of view. Among the common physiological properties is the expansion of the cell space, from that delimited by the plasma membrane to the space of vesicle navigation. Moreover, during the first stage of their generation, extracellular vesicles concentrate specific components in their membranes, which therefore become quite different from the membranes of origin, those of MVBs for exosomes and the plasma membrane for ectosomes. Large differences exist also for the vesicle contents (proteins, RNAs and DNA sequences) with respect to the cytosol. The latter differences start with the binding of some cytosolic components to proteins of the vesicle membrane, followed by their binding to additional components, with ensuing generation of the matrices of vesicle lumena. The most interesting processes, however, are vesicle fusions, largely undefined both in terms of receptors involved and establishment of membrane continuities. From the pathological point of view, the changes of expression of the proteins encoded by RNAs and DNAs transferred to the cytosol by vesicle fusion are highly important. This process can account for the generation of critical proteins in cancer cells, due to the new DNA transcription and/ or RNAs translation processes. Also important are the changes of vesicles in the serum and urine already discussed. Extracellular vesicles are the subject of a specific Society, the International Society for Extracellular Vesicles (ISEV), which organizes a meeting every year. In this occasion attention is mostly focused on exosomes. However interest about ectosomes is growing. The concomitant investigation of the two types of vesicles, with recognition of their common and differential properties, is therefore becoming more and more popular. We expect that, in the future, new properties of the two types of vesicles will be identified, with interesting consequences also in pathology, the area in which most studies are now being carried out. This review has been supported by the 5X1000 project and by the Italian Ministry of Health. Cocucci E, Meldolesi J (2015) Ectosomes and exosomes: shedding the confusion between the extracellular vesicles. Trends Cell Biol 25: 364-372. Heijnen HF, Schiel AE, Fijnheer R, Geuze HJ, Sixma JJ (1999) Activated platelets release two types of membrane vesicles: microvesicles by surface shedding and exosomes derived from exocytosis of multivesicular bodies and alpha-granules. Blood 94: 3791-3799. Denzer K, Kleijmeer MJ, Heijnen HF, Stoorvogel W, Geuze HJ (2000) Exosome: from internal vesicle of the multivesicular body to intercellular signaling device. J Cell Sci 113: 3365-3374. Johnstone RM, Adam M, Hammond JR, Orr L, Turbide C (1987) Vesicle formation during reticulocyte maturation. Association of plasma membrane activities with released vesicles (exosomes). J Biol Chem 262: 9412-9420. Hess C, Sadallah S, Hefti A, Landmann R, Schifferli JA (1999) Ectosomes released by human neutrophils are specialized functional units. J Immunol 163: 4564-4573.